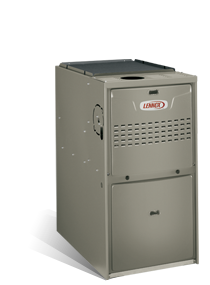 The Lennox Merit® Series ML180 residential gas furnace offered by Logical Heating and Air Conditioning provides economical, standard-efficiency gas heating. Enjoy the exceptional comfort that comes with reliable Lennox resdential gas furnace engineering. The ML180 residential gas furnace’s durable, high-quality design ensures long-lasting performance. And with an efficiency rating of 80% can save you in energy costs, especially compared to an older furnace, during Minnesota’s cold winters. Efficiency rating of 80% AFUE—can save you hundreds of dollars each year, compared to older furnaces. Duralok Plus™ heat exchanger—made of high-quality, patented ArmourTuf aluminized steel. Hot surface igniter—controls furnace operation to ensure reliable, efficient performance.